So, what's new? Well we've got a lot more stuff in the shop now! Over the summer we put quite a bit of effort into making sure that we have items in stock that divers need right away. We're now carrying the RinseKit pressurized rinse system, Shearwater Dive Computers, as well as a ton of other accessories, tools and fun stuff! The new line of Aqua Lung dive knives are in as well. These new knives are great! 3 sizes to choose from in Stainless or Titanium. We know the dive season is starting to wind down here in New England, but don't let that stop you from diving! 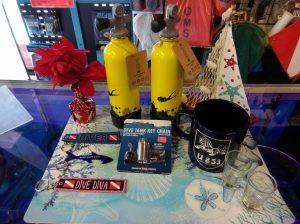 Many of our divers at Dive On It dive year round and we can help with that! We offer Drysuits from DUI, OMS & Aqua Lung. Buy a DUI suit from us in October or November and get either $50 off any new stock sized suit, or $100 off any new, signature custom sized suit. Once November hits we'll be on our Winter Hours till March, but we'll still be open 5 days a week! Beginning November 6th the shop will be open Thursday - Sunday and closed on Tuesdays & Wednesdays. Our hours on Monday & Thursday will be 4pm - 8pm, Fridays 3pm-7pm and 9am-3pm on weekends. Also, we'll be closed from November 1st thru the 5th to attend the Dive Equipment & Marketing Association annual convention in Orlando, FL.